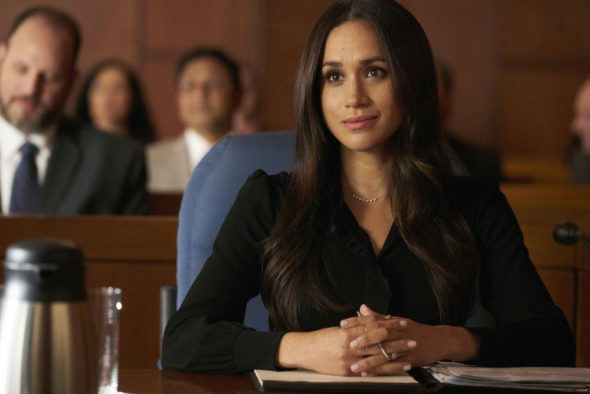 Pictured: Meghan Markle as Rachel Zane (Ian Watson / USA Network). It’s been a busy day at Pearson Specter Litt. 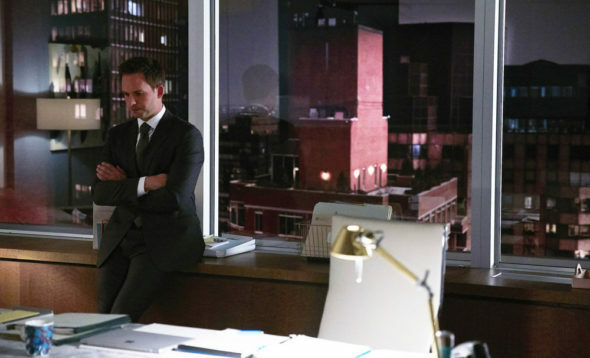 Suits has been renewed for an eighth season on USA Network, but without stars Meghan Markle and Patrick J. Adams (the latter of whom isn’t even marrying Prince Harry). The network has also announced Suits will return for the second half of season seven on Wednesday, March 28, 2018 at 9:00pm ET/PT. Additionally, the seventh season finale, in which Mike Ross (Adams) and Rachel Zane (Markle) will make their final bows, is slated to air on April 25th. A USA Network legal drama, the Suits TV show centers on ace attorney, Harvey Spector (Gabriel Macht) and his college dropout protegé Mike Ross (Patrick J. Adams). 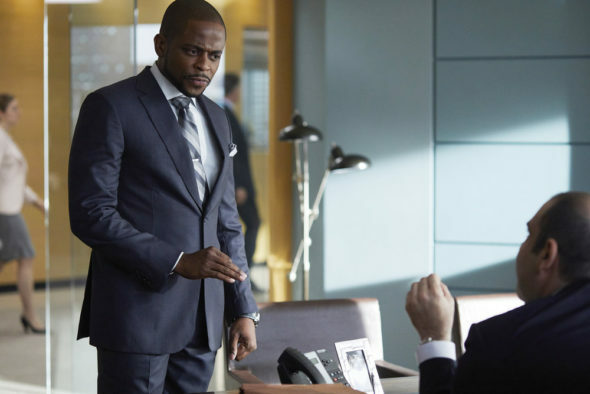 Dulé Hill is being promoted to a series regular role in season eight, and will join returning regulars Macht, Sarah Raftery, and Rick Hoffman. The Gina Torres Suits spin-off will be introduced in the second half of season seven. Pictured: Patrick J. Adams as Michael Ross (Shane Mahood / USA Network). On Instagram, Adams posted a farewell to his Suits fans. Check it out. Check out this USA press release for more on the Suits season eight renewal and season 7B premiere. NEW YORK, NY – January 30, 2018 – USA Network and Universal Cable Productions announced today that SUITShas been renewed for an 8th season. Show creator and executive producer Aaron Korsh is set to return, as are stars Gabriel Macht (Harvey Specter), Sarah Rafferty (Donna Paulsen), Rick Hoffman (Louis Litt) and newly-minted series regular Dulé Hill (Alex Williams). Pictured: Dulé Hill as Alex (Shane Mahood / USA Network). What do you think? Are you surprised Suits was renewed for season eight without both Markle and Adams? Do you plan to keep watching this USA Network TV series? Let us know, below. who ever thought that this was a good idea clearly didnt see what happened to “one tree hill” after L and P left the show in season 6 and it killed it. it was never the same and it went to hell. I won’t be watching a show I really enjoyed because of the addition of Katherine. Don’t like her. I will miss Megan and Patrick immensely, but will continue to watch the show!! I would like to come in the riders on doing such an outstanding job of writing about good things, rather than all the inappropriate and insignificant things that most TV shows are filled with. It is a pleasure to watch! I particularly enjoyed the episode before the season finale, very very well done!! This show is the GREATEST show on television. While I will miss Mike and Rachel I look forward to what these wonderful writers have in store. I will not miss one episode. Pearson, Spector, Litt will be curious without Mike & Rachel to temper Harvey’s rants (and vice-versa ;)), but as long as there can be a Harvey – Donna banter, I will continue. Besides, TNT pulled it off with ‘The Closer/Major Crimes’, so there is hope! I see it as a chance to bring fresh air to the show. As long as Harvey is still around, I’ll keep watching! Exactly. It’s always been about Harvey. You can get a new guy or focus in Harvey now. The other characters are amazing as well. This doesn’t have to end with Mike and Rachel. I thought this show had been cancelled. Why can’t Rachel just leave? Mike is the main character, the show is his relationship with Harvey…. it won’t be Suits when he leaves. Most likely will not be watching now that Patrick Adams is no longer part of the series. He was the main stay and I can’t imagine how the series will survive without him. This is the demise of SUITS! Love this show. Glad it is being renewed w/o the two departed. The show was not only about them. The other characters are great. Will we miss them, sure but I do believe in the writers to keep the show going! Can’t wait to see how it unfolds. The show could still go on but I don’t know how invested I’d be in watching it without Mike and Rachel. And if I’m being honest, I’m not doing backflips over a Jessica Pearson spinoff either. I am finished with the show after they leave. It won’t be Suits anymore.